This year at SIHH, Montblanc unveiled the 1858 Collection: a series of watches inspired by mid-century references from the brand’s forerunning Minerva manufacture. Across the board, the collection has a decidedly vintage sensibility, with a focus on practical complications and period-accurate finishing. This translates into a couple of recurring themes likely to ring familiar to Montblanc fans: longer lugs, crown fluting, the use of domed sapphire crystal, and cloisonné cathedral hands on the dial. Montblanc have even substituted their more contemporary branding in favour of a mountaineering-themed logo. The jumping off point for these new Minerva-flavoured releases is the 1858 Automatic: a 40-millimetre time-only sportwatch. Designed in a two-tone combo of bronze and brushed steel, it’s a style which will immediately appeal to vintage enthusiasts. Although available in two dial executions, the champagne version features subtle sunburst finishing, elevating it beyond the pale of most monochrome steel watches. 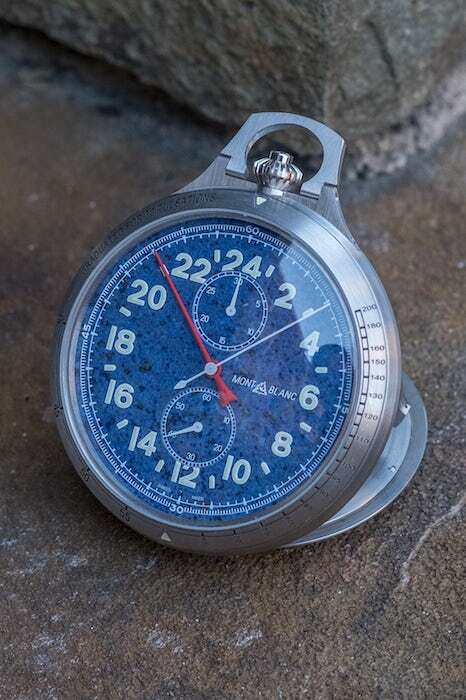 For horology nerds who already have their time-only bases covered, the 1858 Monopusher Chronograph Limited Edition 100 is a satisfying alternative. At the core of its value proposition is the MB M13.21 — an in-house movement developed at Montblanc’s Minerva manufacture. An homage to the Villeret workshop’s calibre 13.20 (launched in 1920), the M13.21 used in the new Monopusher Chronograph benefits from the former’s technical pedigree. Executed with all the details one would expect from a high-end chronograph, plates and bridges are made using rhodium-plated German silver; and finished with “devil’s tail” decoration (inspired by Minerva’s historical arrowhead logo). 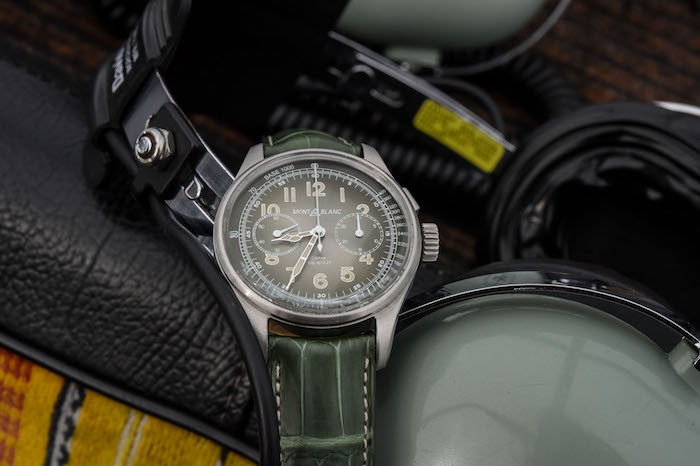 For this release, the Montblanc design team also clearly favoured an unconventional colour palette, with an overall aesthetic that heavily utilises varying shades of green. Despite its handsome profile, the Monopusher Chronograph still isn’t the boldest model in the new collection. 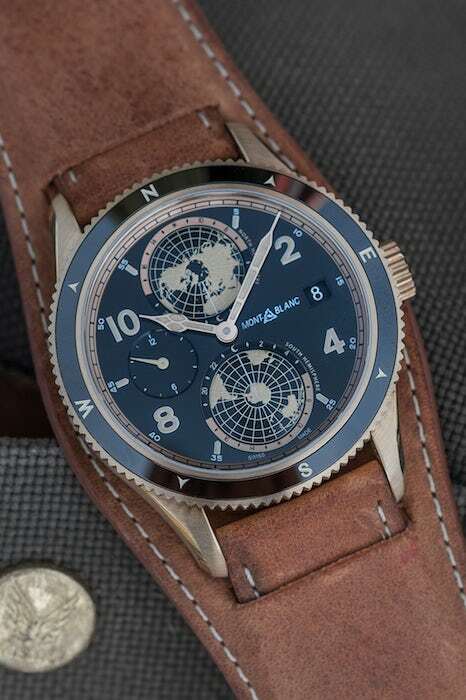 That honour goes to the Geosphere, a travel watch incorporating two time zones and dual hemisphere world timers. 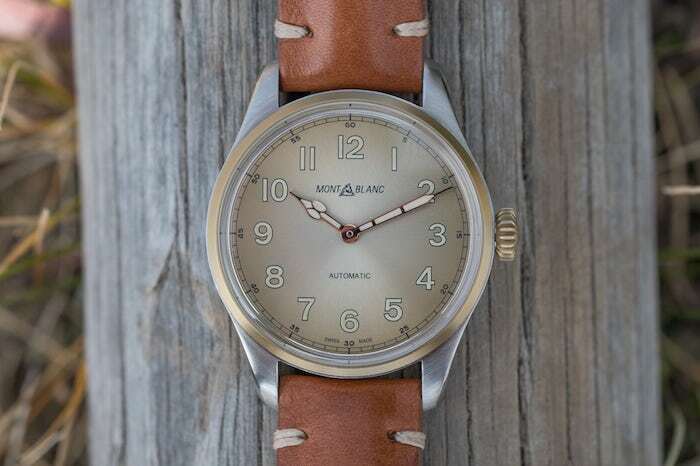 The theme of adventure — manifested throughout the 1858 collection — gets its most direct throughline in the Geosphere, especially when the watch is worn on the natively equipped Bund-style strap. 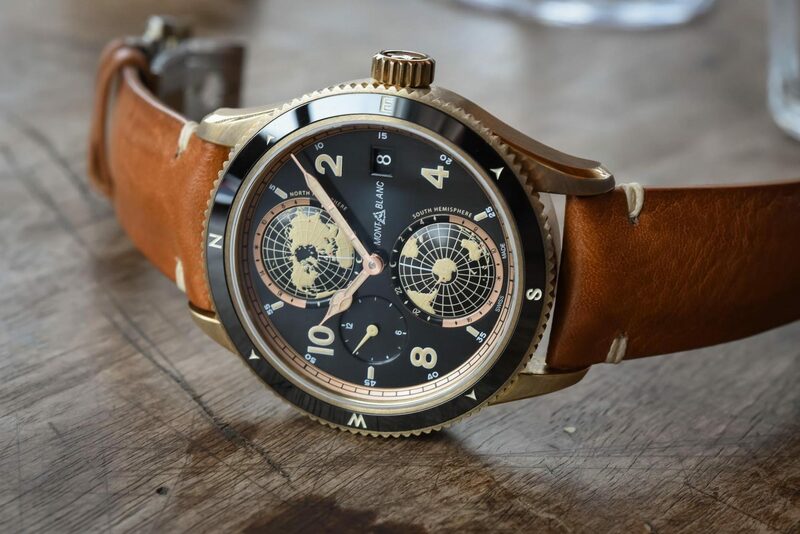 Although available in stainless steel, Montblanc also opted to release the model in a limited run of 1,858 bronze units. Exotic straps can often feel like a gimmick, but the warmth of the Geosphere in bronze nicely complements the accompanying cuff sized Bund strap in brown suede. Not content to let IWC have all the fun, Montblanc are also anchoring this year’s SIHH releases around a curio product — the Pocket Watch Limited Edition 100. 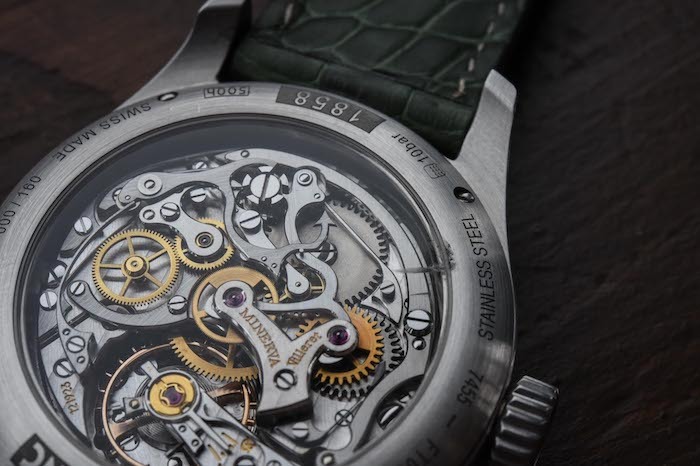 Once you get past the initial novelty of the non-wristwatch format, this model proves itself extremely versatile: It’s usable as a table clock or navigational tool (thanks to the integrated compass on the caseback). Despite its gargantuan 60mm proportions, it’s also extremely user-friendly thanks to a lightweight titanium casing and excellent legibility. That legibility is further enhanced by the use of Dumortierite stone in the dial — a blue-tinged mineral which improves readability under dim lighting conditions. Best of all, the Pocket Watch is powered by a Minerva movement (the MB M16.24), bringing this model full circle with the rest of the collection. Watches in the Montblanc 1858 collection start at approximately US$2,888. To view the whole collection, visit Montblanc online.